Solarbio Cell Separation Medium is a sterile, ready-to-use and low levels of endotoxin density gradient separation medium. It is designed for the isolation of viable cells such as lymphocytes, monocyte, mononuclear, leucocyte, polymorphonuclear granulocytes from peripheral blood, spleen, bone marrow, tumor infiltrating tissue and other viscera of human and other different kind of animals including mouse, rat, guinea pig, chicken, duck, goose, dog, pig, bovine, goat, equine, monkey, rabbit and fish. It consists of a mixture of Sodium Diatrizoate combined with Dextran500 to induce erythrocyte aggregation and reduce platelet aggregation resulting in a higher yield and purity of the target cells. Solarbio Cell Separation Medium is based on the methodology established by the studies of Bøyum and investigations carried out in our laboratory. Techniques for separation of the major subgroups of different cells are mostly based on distinct density differences. Mononuclear cells (monocytes and lymphocytes) have a lower density than granulocytes and erythrocyte, and different migration of cell types can be separated after density gradient centrifugation with our Cell Separation Medium. l Simple and convenient operation, complete the entire separation process within 20 mins. l Solarbio Cell Separation Medium Kit contains the required reagents of Dilution buffer and Washing buffer, which facilitate the separation procedure. l High recovery, purity and viability of the separated cells. Lymphocyte Separation Medium is designed for the isolation of lymphocytes from peripheral blood. Anticoagulant-treated blood or defibrinated blood is diluted with an equal volume of Dilution buffer or phosphate buffered saline solution, carefully layer the diluted blood over the Separation Medium (Using a Pasteur pipette, carefully layer the diluted blood over the medium, with as little mixing as possible at the interface) and centrifuged for 20~30 minutes at 500~1000g at room temperature. After centrifugation, there will be well-defined mononuclear cells at the interface. 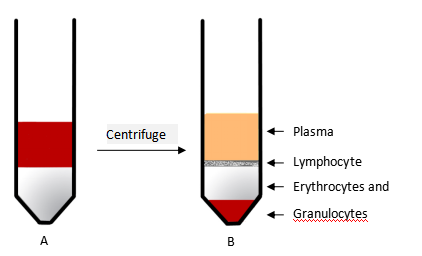 The top layer is plasma; in the middle of the tube is transparent Lymphocyte Separation Medium; at the interface between the plasma and the Lymphocyte Separation Medium is lymphocyte; erythrocytes and granulocytes should pellet to the bottom of the centrifuge tube. Discard the supernatant, respend lymphocyte pellet with phosphate buffered saline solution or appropriate cell culture medium. Solarbio Cell Separation Medium has a high recovery, purity and viability of the target cells. 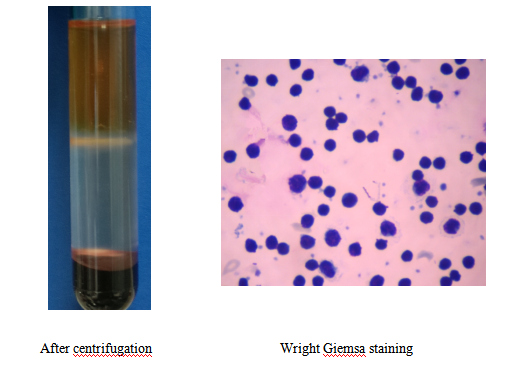 After centrifugation, a well-defined target cells at the interface can be observed clearly and a hign purity of lymphocyte can also be observed after Wright Giemsa staining. 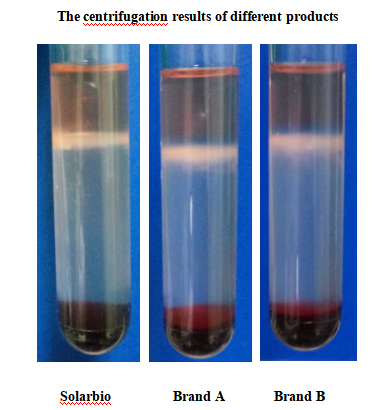 Comparision of separation results of different Separation Medium products are listed below. As can be seen from the centrifugation results, the target cell of “white membrane” isolated by the Solarbio Cell Separation Medium is very clear and no diffusion. 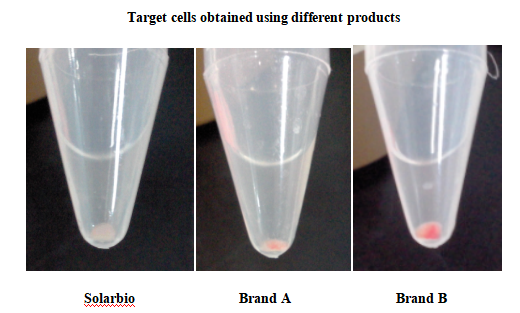 Under the same separation conditions, the obtained “white membrane” cells isolated by Brand A and B are partially dispersed to the separation medium, which indicate that Solarbio Cell Separation Medium is better than the other two products. Compared with the cell precipitation, the lymphocytes obtained with the separation medium of Solarbio are relatively pure and the erythrocytes pollution is minimal, while the lymphocytes obtained with the separation medium of Brand A and B have more red blood cell pollution and visible red blood cell precipitation at the bottom of the tube.